Rosendo Villafuerte-Vega and Maja Murphy address the school board about issues affecting Latino immigrant students and their families. 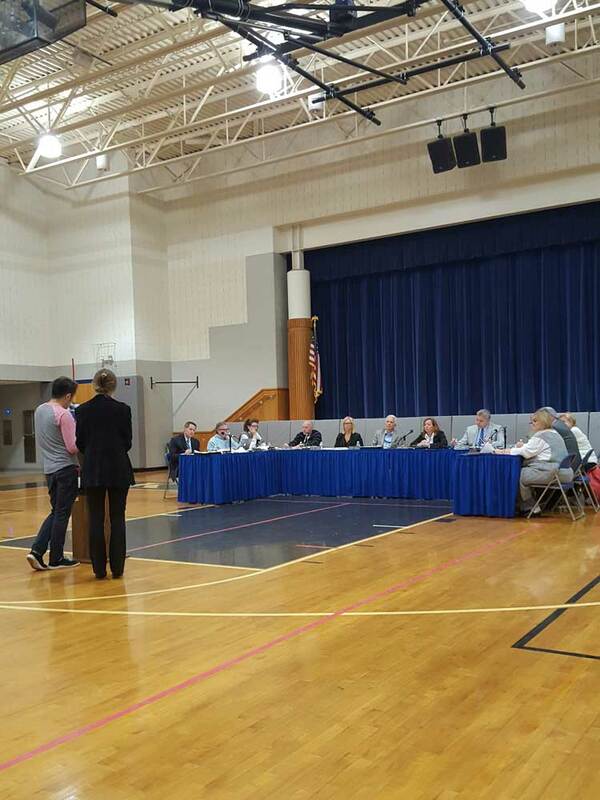 KENNETT SQUARE – On Monday night, members of the Latino community asked the Kennett Consolidated School District Board of Education to consider implementing additional measures to address the issues of racism and immigrant student safety that have arisen in the wake of the 2016 election. Maja Murphy, a parent in the district, spoke first. “Our Latino families and children are experiencing great stress and anxiety and fear in this time of uncertainty,” she said, noting that while she had a productive private meeting with Superintendent Barry Tomasetti to discuss what the district is doing to help affected students, she wanted the issue to be discussed in a public forum. “Immigrant families, not just Hispanic and undocumented people, make up about half of the student body, and they do not feel like they are being heard,” she said. Murphy introduced Rosendo Villafuerte-Vega, a graduate of Kennett High School and an undocumented immigrant whose family moved to the area from Mexico when he was a child. He shared his personal success story, including how his mentors at school motivated him to attend and graduate from college. Villafuerte-Vega then asked the board to issue “a stronger statement to parents and students that the schools in the district are safe spaces, free of anxiety and intimidation,” and that they would not cooperate with immigration enforcement. He also asked them to form an advisory commission of Latino students and community leaders who can help affected families use the resources available to them, offer cultural competency training to teachers, and to issue any official communications on the topic in both Spanish and English. Tomasetti also said that a bilingual letter was sent to parents notifying them that the district would not permit any immigration office to remove students from schools, nor would they give information to immigration officials. He noted that meetings have been held with Latino and other student groups to hear their concerns and with teachers to foster awareness. “I feel that we did hear you, we have taken some action, and we are continuing to communicate with our staff to be very sensitive to the needs of all students,” Tomasetti said, adding that the district has started working directly with Latino parents to help them with the challenges they are facing. In other news, the board unanimously approved the proposed final general operating budget for the 2017-2018 academic year, in the amount of $84,211,369. Although this budget will require a real estate tax increase of 2.19%, treasurer Michael Finnegan noted that the final amount was less than what was originally anticipated. At the start of the meeting, there was a ceremony to recognize students from Greenwood and New Garden Elementary Schools and Kennett Middle School who had achieved mathematical accomplishments during the academic year. Five KMS students were also honored for creating a video called “What’s So Cool About Manufacturing”, which won the “Dream It. Do It. PA” Chester and Delaware student video contest.